Our Mpumalanga holiday resort offers accommodation to suit your every need. EMAIL US info@tranquilnest.co.za or Enquire Now! If you wish to enquire about our accommodation, please contact us. Hazyview has become the hub of Mpumalanga, catering to local and international visitors. Tranquil Nest is conveniently situated adjacent to the R40 between White River and Hazyview making it a conveniently located Mpumalanga, Kruger holiday resort. Each chalet is nestled amongst indigenous trees, home to a wide variety of birds, overlooking The Sabie River Valley which lies at the edge of the escarpment of the misty Drakensberg Mountains. Various animals frequent the Mpumalanga holiday resort including Zebra, and small buck to name a few. The Kruger National Park remains one of the top tourist attractions in the world and this vacation resort in Mpumalanga is only 12km from the Numbi and Phabeni Gates. Our Mpumalanga holiday resort offers accommodation to suit every need and our attention to detail will ensure that your every need is met, and that you get a little more than expected. We also now generate our own electricity in the event of power failures, and have back up water, which means your comfort will not be interrupted. Each chalet is nestled amongst indigenous trees, home to a wide variety of birds, overlooking The Sabie River Valley. Tranquil Nest has a variety of services available on-site and off-site to suit your every need. Tourist attractions, activities of all kinds, from family activities to adventure activities in Hazyview, Mpumalanga. 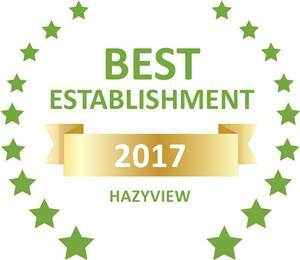 Temperatures in Hazyview vary from mild winters between 04 - 22 C to warm hot summers between 20 – 38 C.
Based on reviews of establishments, Tranquil Nest has been voted Best Establishment in Hazyview for 2017.